Native American Flute is a wonderful instrument to learn at any age as it is relatively easy to play and does not require reading written music, or a musical background. Erika has been teaching NAF to adults since 2001, and kids since January 2011. I have always loved music. I began playing piano at age 6, classical silver flute at 9, and singing in school choir at 9. I continued to play piano, flute and sing throughout high school and into college. I graduated from U of MT in 1995 with a B.A. in Hydrogeology. In 1998, I traveled to South America and purchased a Kena, my first indigenous flute. I loved experimenting with this new flute and decided I would teach myself to play spontaneously, ‘from the heart’, as I had only learned to read and play written music. 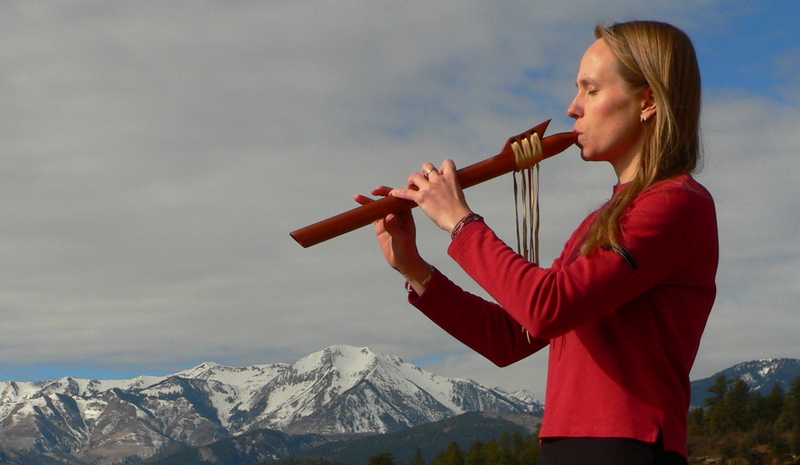 Upon returning to the U.S., I purchased my first Native American flute while living in Jackson, Wyoming. This began a love-affair with this beautiful, sacred instrument. I have continued to play, perform, record and collect Native flutes, including the Indian Bansuri transverse flute, for over 17 years. I have played a variety of events: weddings, Native ceremonies, a concert with Krishna Das in Boulder, Colorado, poetic book readings with Dolores LaChapelle, and background meditation music for Diane Zumer’s “Creating Heaven on Earth” CD. I plan to record both a child’s and adult’s music and meditation CD. I do not use written music and instead teach students to play ‘from their heart’. I would call my style of teaching “Intuitive Teaching”. Students learn about music style, terminology and techniques. Contact Erika to schedule. Various times available. Smiley Building, 1309 E 3rd Ave, Studio #10 (first floor). 48-hr cancellation notice required, otherwise full cost of lesson is charged. The one exception is due to illness, as long as I receive notice in the morning.